Chemistry: Li(Mn, Fe)PO4, Lithium Manganese Iron Phosphate. Uses: As a source of lithium and phosphorus and as mineral specimens. Lithiophilite, which is sometimes spelled lithiophylite, is a rather scarce phosphate mineral. The name can be loosely translated from the Greek as "lithium lover". Although it is scarce and generally does not form good crystals, it does have a wonderful although indirect benefit to the mineral world. Lithiophilite is a primary phosphate mineral found in phosphatic pegmatites and pegmatitic dikes. It alters easily into other phosphate minerals, especially manganese phosphates. These rare phosphate minerals are usually brightly colored and make wonderful mineral specimens. Some mines have been made famous by their suites of unusual and beautiful secondary phosphate minerals such as eosphorite, reddingite, sicklerite, hureaulite, fairfieldite, dickinsonite, stewartite, vivianite, salmonsite, strengite, purpurite, heterosite, phosphoferrite, wolfeite, triploidite and fillowite to name a few. And where did these phosphates come from? They are the products of the alteration and/or weathering of lithiophilite, triphylite, amblygonite and a few other primary phosphate minerals. This fact makes lithiophilite an appreciated mineral. Lithiophilite forms a solid solution with the often associated mineral triphylite. Triphylite's formula is Li(Fe, Mn)PO4 and differs from lithiophilite by being rich in iron instead of manganese. The structures of the two minerals are the same and therefore any differences in physical properties between the two would be related to the iron/manganese percentage. Lithiophilite is slightly less dense and is pinkish to greenish brown whereas triphylite's color tends toward blue and blue gray. Color is pinkish to greenish brown. Transparency: Specimens are transparent to translucent. Crystal Habits do not include well formed crystals because most crystals are embedded and appear as compact, cleavage masses and intergrown crystal clumps. Cleavage is near perfect in one direction (basal) and imperfect in two directions (prismatic). All cleavages are at right angles to each other. Specific Gravity is approximately 3.34 (above average), but increases with increased iron content. Streak is white to grayish-white. Other Characteristics: When powdered and placed in a gas flame, it gives the flame a bright red color and this indicates the presence of lithium. 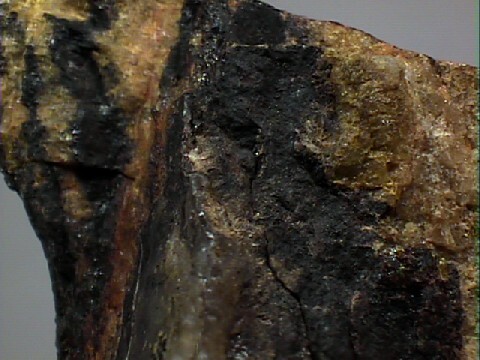 Hyper-weathering produces a black stain of manganese oxides. Associated Minerals include lepidolite, beryl, quartz, albite, triphylite, amblygonite, spodumene and various manganese oxides. Associated secondary phosphates include eosphorite, reddingite, sicklerite, salmonsite, strengite, purpurite, phosphoferrite, wolfeite, triploidite, hureaulite, fairfieldite, dickinsonite, stewartite, vivianite, heterosite and fillowite. Notable Occurrences are widespread and include Verutrask, Sweden; Mangualde, Portugal; Bavaria, Germany; Buckfield, Poland; Karidid District, Namibia; Namaqualand, South Africa; the Buranga pegmatite, Rwanda; Yellowknife, Northwest Territories, Canada; Rajasthan, India; Rio Grande do Norte, Brazil and Pilbara District, Australia. In the United States localities include Pala District of San Diego County, California; Newry, Stoneham and Topsham, Maine; Palermo Quarry, North Groton, New Hampshire; Custer, South Dakota and Branchville, Fairfield County, Connecticut. Best Field Indicators are color, associations, environment, cleavage and density.